As everyone knows, the presidential contests started early this round. But how much attention are the races getting from ordinary people (i.e. not us junkies here.) 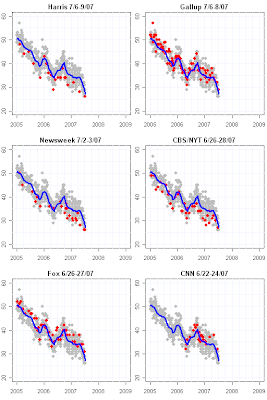 The debates have had small audiences, but news coverage is quite substantial. How much attention are voters paying? As I read a list of some stories covered by news organizations this past week, tell me if you happened to follow each news story very closely, fairly closely, not too closely, or not at all closely. News about candidates for the 2008 presidential election? Looking at those saying they are following the news about the campaign "very closely" we find the pattern in the figure above. Around 20% of the sample of adults say they are paying this much attention to news about the election. On the one hand, that means many are not. On the other, no previous election for which we have polling this early comes close to that 20% figure. 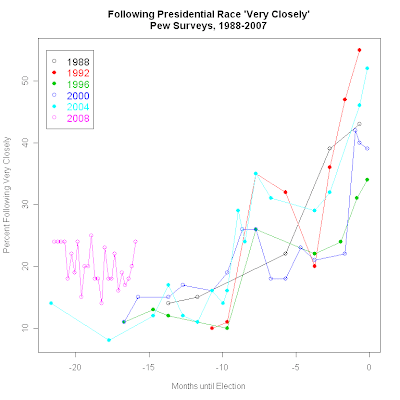 The three previous races with any polling as early as this found 10-15% paying "very" close attention to the campaign. Only about 10 months before election day, or about the start of the primaries and caucuses, do we typically see interest move up to high levels, varying from about 18-35% over the various election years. So this year's level of interest looks quite high, compared to previous years about this time, but at an absolute level, it remains only a fifth of adults who are glued to campaign news. 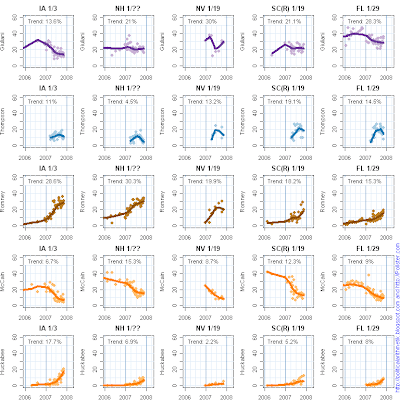 If we add "very closely" with "fairly closely", the current interest is 53%, a substantial increase, but the pattern in the plot is unchanged-- 2007 stands above any previous year, but the final attention by the general election rises to over 90% when using this combined measure, so 53% now is certain to rise to near 100% by November 2008. So either analysis says current attention is well above the norm, but still has a lot of room for increase. The most interesting races have, oddly enough, involved incumbents named Bush. The 1992 three way race and the 2004 contest provoked the greatest attention from the Pew samples. Curiously the closest of all contests, 2000, had the second lowest final attention measure of the five completed races in the plot. Comparing attention today with past races, we appear about 5-6 months ahead of attention in previous cycles. The 20-25% paying high attention now is usually reached around January of the election year. One interesting question is how much, and how soon, attention will grow. Perhaps we are starting high this cycle, but will converge to the range of previous cycles by January. Or perhaps we'll remain above past races through November 2008. Wait and see. The one constituency that is certainly paying more attention earlier is pollsters. 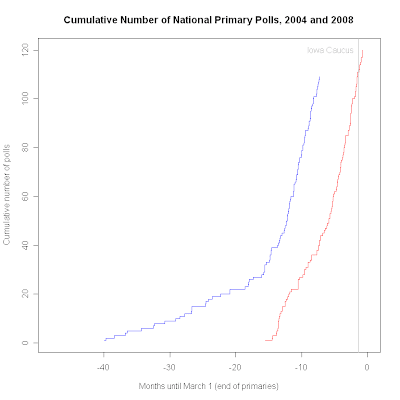 At this point in the 2004 cycle, there had been 53 national nomination polls. As of July 22 this year, we had 109, more than double the previous pace. The earliest consistent polling on the 2004 race began after November 2002. (I may have missed a handful of earlier polling, but certainly not a great many.) In contrast, regular polling on 2008 began immediately after November 2004. 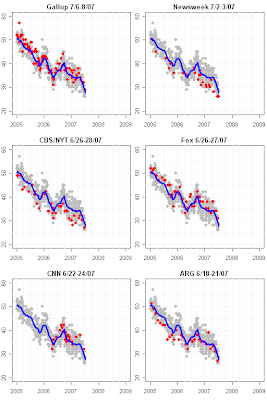 The density of polls in 2005 and especially 2006 was substantially above comparable levels in 2002-03. However, once the contest ramped up, the rate of new polls has been quite similar between the two years. 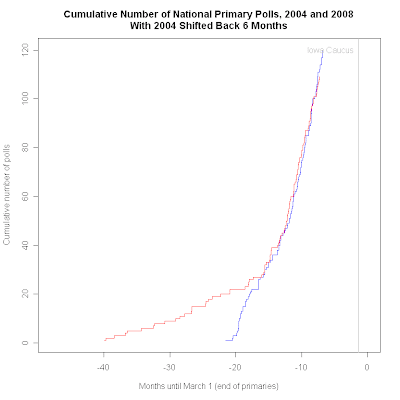 When the blue line for 2008 turns sharply up, it runs in parallel to the 2004 polling. Clearly 2008 will ultimately far outstrip 2004, but for now we are seeing comparable rates of polling, just shifted back in time. The shift is the equivalent of six months in the campaign schedule. If I shift the 2004 data back by exactly 6 months, the result is a near perfect match, seen below (again, after the longer run up in 2004-2006). So for those of us obsessed with campaigns and public opinion, this is great news-- the most studied race in history in going on right now, and we have box seats. A quick reminder not to assume what is today will be so tomorrow. 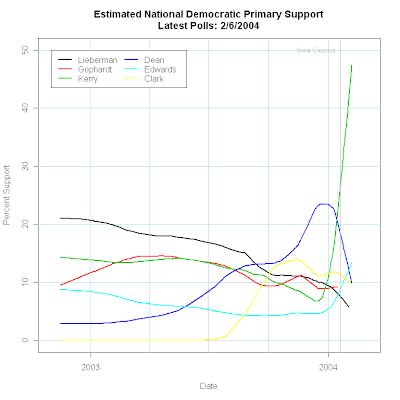 The 2004 Democratic primary race as of late July 2003 showed a continuous first place held by Lieberman, though with a slow but steady erosion. Kerry and Gephardt locked in a long running tie, and Howard Dean a rising 4th place at about 12% support. Clark's late entry and sharp rise hadn't happened. Edwards looked like a goner as his initial 9% had sunk to about 5%. So from this, who would be the candidates left standing after Iowa? But of course the dynamics changed. Between summer and late fall, Dean became the "inevitable" nominee, sparking talk of running mates and gaining Gore's December endorsement. Kerry by that point was under 10%. To those who say this is clear evidence that early polling is useless, I'd say no-- early polling is reflecting the dynamics of the race. But the dynamics are highly fluid and the point of the polling is not to predict the winner from today's polls, but to understand how the race is moving and ultimately to look back at how we got to the final outcome. The great mistake analysts make is to look at current polls and conclude from them that the dynamics are fixed. That Dean can't rise. That Dean is a lock. That Kerry was inevitable after all. The current Democratic race appears, as of last week's polling, to be relatively static. And compared to the Republicans that is certainly true. But let's not jump to the conclusion that the polls after Labor Day have to look like today's just because today's look like June 1. The polls are of interest for what they show about the history of the race so far and how it stands today. Not for their ability to predict what happens in a month or two. New polls have moved noticeably above President Bush's recent low point of approval, though the current trend estimate remains below 30%. New polls have generally fallen at 30% approval and above, though one is as low as 25%. This change of trend was first discussed about a week ago here. Since then, the evidence for a shift in trend has mounted. The ARG poll, taken 7/18-21/07, sets the low point at 25% approval, 71% disapproval. Gallup, done 7/12-15/07 got approval at 31%, disapproval at 63%. CBS/New York Times has two recent results: 7/9-17/07 has approval at 29%, disapproval at 64%, while the newest CBS/NYT poll of 7/20-22/07 puts approval at 30%, disapproval at 62%. Fox, 7/17-18/07 has approval at 32%, disapproval at 61%, while ABC/Washington Post 7/18-21/07 estimates approval at 33% and disapproval at 65%. So that puts four of the last six polls above 30% with only one in the mid-20s, where polling in late June was falling. The trend estimate now stands at 29.6%, and the slope of the trend has clearly begun to bend from a steep downward trend to a less negative one. This is classic behavior of my standard "old blue" estimator. It takes a while to change direction, and while it does it slowly bends until it shifts direction entirely. In contrast, the "ready red" estimator is more sensitive and picks up on direction changes more quickly. The red line in the figure above shows a sharp change at just under 29% to a current estimate of just under 31% approval. 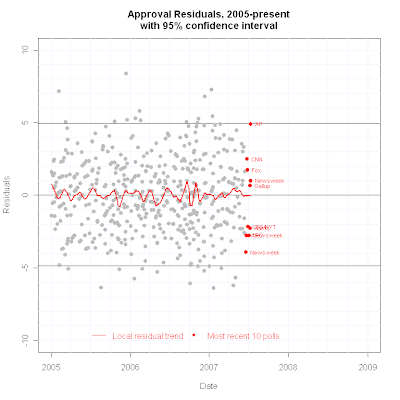 The red line is often too sensitive, mistaking short term random noise for real change. However, we've now accumulated enough supporting polls to make me more confident that the upturn in the red estimator is probably real. At the same time, this does not mean the trend will remain as sharply up as the red estimator seems to suggest. That won't be known for a while yet, as more polls help define what the path of the next month or so is. Recent polls have fallen above and below the trend estimate, and at the moment none of the last 10 polls constitutes an outlier, though there are both high and low polls rather close to the confidence interval limits. 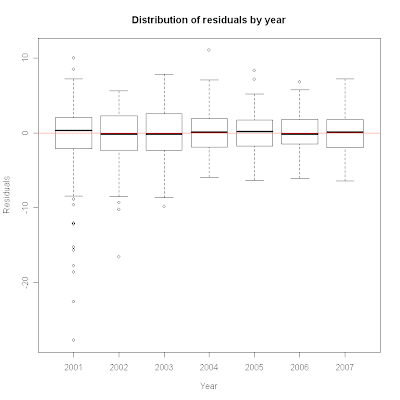 This range of results is also reflected in the very wide gray area at the end of the trend in the Bootstrap plot below. The wide gray area reflects our uncertainty about where approval is right now in a time of change in direction. 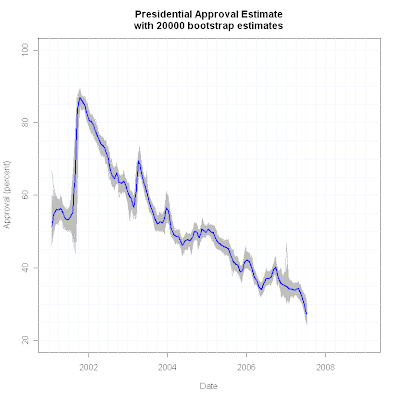 Finally, the last plot below shows the most recent 20 estimates of approval. 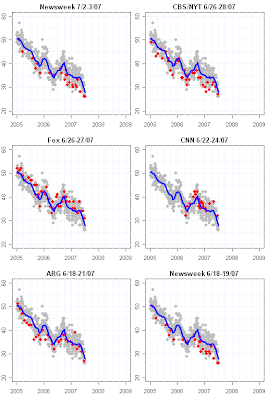 The red dots trace out the clear decline, low point, and move back upwards in the "old blue" estimator. So even that estimator is feeling a change. 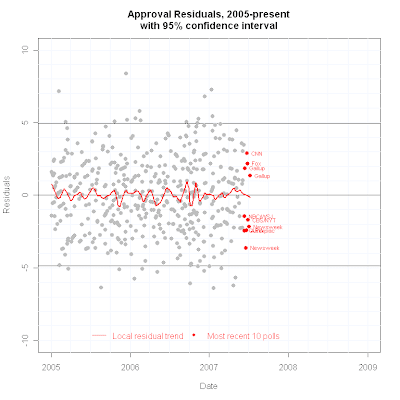 When Mayor Giuliani first announced his candidacy for president, he received a considerable bounce in the polls. We anticipated that the race would close after our initial bounce – in memos written on March 22 and June 22. I wrote, at the time, we should expect polls to tighten, as they have. As the race developed early in the spring, the race quickly but briefly, developed in to a two-way race, and our initial bounce extended into the beginning of this two-way race. The two-way race divided most of the Republican primary vote between 2 major candidates – the nature of a two-way race generally forces undecided or leaning voters to make a choice between the leading candidates and many broke our way. As McCain’s trend line declined Mitt Romney’s slowly rose and Fred Thompson entered the race. Senator McCain is still a candidate for President and continues to receive a substantial vote share. Fred Thompson now seems to be the beneficiary of an announcement (or pre-announcement) bounce. And Fred Thompson’s entry to the campaign has effectively made this now a four-way race. After months as the frontrunner and the addition of a fourth candidate to the GOP primary it is notable that we are in roughly the same spot we were in before our bounce and when this was still a three-way race. In a four-way (or as your graph suggests a five-way race), a trend line from the first of the year until now, excluding our “announcement” bounce, is virtually flat. Major media polls actually show Rudy Giuliani ahead of even the red tend line. And I would add that the red trend line, at this point in the race, disproportionately accounts for the Rasmussen Polls that by their regularity are a drag on Mayor Giuliani’s trend line. Overall, we are very pleased with our performance in national polls. We are aware we will continue to face challenges and the race will likely continue to close. But we believe we have a real and solid base of support and we will remain competitive as this race evolves. Two new polls find higher approval ratings of President Bush than last week, and both polls are above trend, lending more support for the suggestion I made here last week that we may be seeing a leveling off of the recent decline in Bush approval. Gallup's new poll, taken 7/12-15/07 found approval at 31%, disapproval at 63%. A Zogby/Reuter's poll conducted 7/12-14/07 has approval at 34%, disapproval at 66%. With the addition of these polls, the trend estimator is now 29.1%. More importantly the evidence of a change in trend, while still not conclusive, is beginning to be visible even with the standard, stable blue line estimate. The blue trend estimate now shows just a bit of a bend in recent estimates-- what had been declining at a constant rate since April now suggests a change. The more sensitive, but easily confused, red estimator has clearly taken an upward tick. While red is often fooled, and we should not be justified in claiming clear evidence for a turnaround, the indications are now in that direction for the first time in four months. With only the latest four polls showing this move up, we should be cautious. Usually it takes about 12 consistent polls to be confident of a change in trend. But if we are reading early tea leaves, they suggest that the President's recent precipitous decline may be stabilizing. Last week I looked at the collapse of the McCain campaign. Not the collapse of money and staff, but the loss of public support that is at the root of the campaign's failure. Judging by the trend we've seen in McCain's support since November that failure has been clearly coming for some time. But what about the Republican "front runner", Rudy Giuliani? While he has consistently remained ahead in polls of Republican voters, and his campaign is in infinitely better financial shape than McCain's, Giuliani's trend in support is eerily similar to McCain's downward trajectory. Since early March, Giuliani's support has fallen by an estimated 8 percentage points. McCain's fell by 10 points since January. 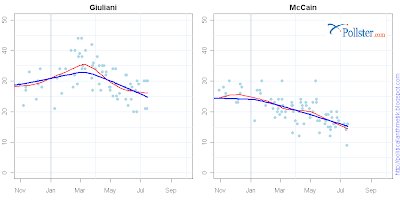 And the rate of decline has been a bit steeper for Giuliani than for McCain. The saving grace for Giuliani has been that he started his decline from a higher point, around 33%, while McCain's slump started down from 25%. Giuliani's national slide is also mirrored in the early primary states, as is the case with McCain. If Giuliani's decline is a little less dramatic in the states than has been McCain's, his situation is still grave in comparison to the rising candidacies of Romney (in IA and NH) and Fred Thompson (nationally and in FL and SC). Were it not for the fundraising success of the Giuliani campaign, and its cash on hand ($15M), the analysis of his situation would be far more pessimistic than recent accounts have made it sound. In part the recent intense focus on McCain may have distracted analysts from the similar trends for Giuliani, but the attention should now shift from McCain being forced to take public transportation between campaign events to the prospects of the other candidate the press has labeled the Republican "front runner". Are there any bright spots for Giuliani, other than money? Yes. 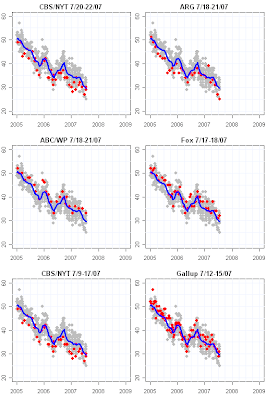 There is a hint in the data that his decline may have slowed and support stabilized in the last month. In the first plot above, the blue line is my standard trend estimator which is rarely mislead by "blips" in the polls, but which is also a bit slow to be convinced that a change of trend has occurred. The red line in the plots is my more sensitive estimator-- quicker to notice a change, but also more easily fooled by "changes" that turn out to be phantoms. The red estimator has flattened out recently for Giuliani, and currently sees relative stability at about 26%. 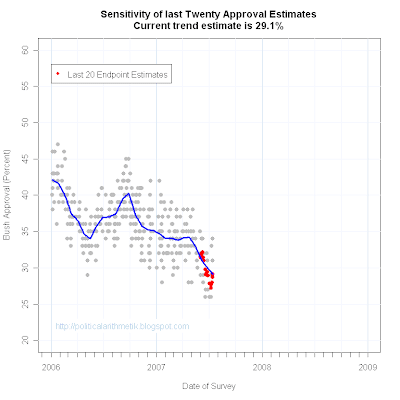 The blue estimator instead sees continued decline and a current level just under 25%. If the red estimator is right (and it often isn't) then perhaps the worst days of declining support are now behind Giuliani, at least nationally. If so, his campaign can try to get the trend moving up instead of down, but at least the decline has stopped. Unlike McCain, Giuliani has the money to try to make the numbers turn up. But to make his campaign surge, Giuliani has to face the rise of Fred Thompson, whose trend estimate is now up to 20.1% nationally and with a very steady upward trend since May. Thompson is also trending up in Florida and South Carolina, while Giuliani slumps in those states. And his prospects against Romney in Iowa and New Hamphire are looking poor as well. So while the national trend may be stabilizing, the Giuliani campaign is confronted with serious challenges in at least four of the first five states. Let's check back in on this around Labor Day and see if the trend lines above have crossed. If they have, the second Republican "front runner" will have stumbled. Congress appears to be less than the sum of its parts. Current approval of the job Democrats are doing in Congress has a current trend estimate of 34.5%, while the estimated approval of Republicans in Congress is 28.8%. 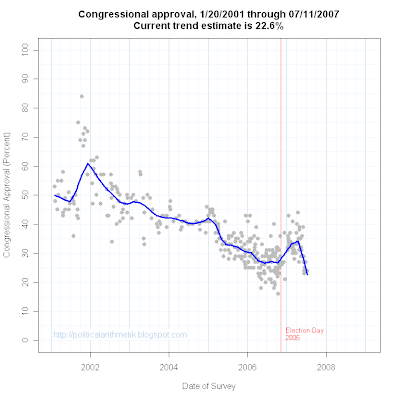 But overall approval of Congress has sunk to a miserable 22.6%, less than that of either party. 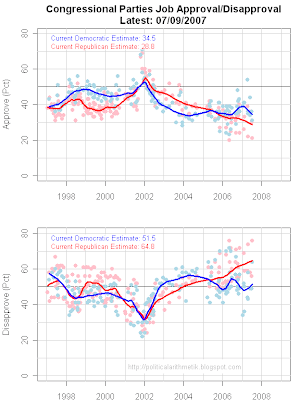 Disapproval of Congressional Republicans remains a good deal higher than for Democrats due to a higher "don't know" rate in evaluating the Democrats. Disapproval of Republicans is at 64.8% while disapproval of Democrats is at 51.5%. Approval of both parties has been trending clearly down since January, while disapproval has trended up over the same time for both parties. Amid the stories noting that approval of Congress is now below that of President Bush, it would be good to recognize that such simplistic comparisons are dangerous. Voters carry a generally negative view of the institution on Capitol Hill. Divided by parties, support is a bit higher. Still, neither party can be comfortable with their current approval ratings. Republicans should note that they continue down despite enjoying a new Democratic majority to target for criticism. And Democrats should take little comfort in the small advantage they hold in approval. 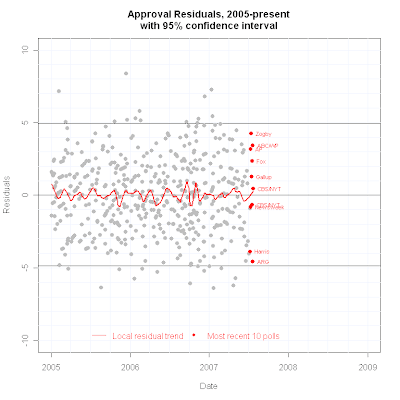 Democratic approval is trending down a bit faster than is Republican approval. Neither seems to have sold the public on their legislative agendas. 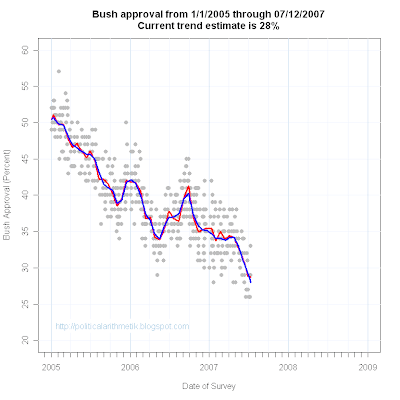 Two new polls at the end of last week find approval of President Bush a bit above recent trend estimates. The Associated Press poll, taken 7/9-11/07, found approval at 33% with disapproval at 65%. A Newsweek poll taken 7/11-12/07 got approval at 29%, disapproval at 64%. Prior to these polls the trend estimate was 27.2%. With the two added, the trend estimate now stands at 28.0%. This is the first time we've seen a pair of polls above trend in a while. Balance above and below trend has been the recent rule. For AP, this is a 1 point gain from their early June poll, while for Newsweek it is a 3 point gain over the previous week. Neither would qualify as a statistically significant change. I'm normally quite cautious about suggesting a change of trend based on only two polls. That caution is especially important here because the AP result at 33% is right on the margin of the 95% confidence interval, as close to an outlier as you can get. Indeed, without the Newsweek poll, AP would be a bit outside the 95% confidence interval. But tossing caution to the wind for a moment, it wouldn't be a surprise if the President's sharp decline is due for some leveling out. Approval was stable from December through April, starting down around April 24th. Since then it has been sinking at a nearly constant rate for over two months. This has brought the trend in approval solidly into the 20s for the last 10 polls, not a simple "blip" down. But to sustain approval this low requires Republican support for Bush sinking below 60% or Independents sinking to the mid-teens. Democrats are already below 10%, so can't contribute much to further decline. The question is whether Republicans are yet willing to reduce their support for President Bush still further. Republican Senators have begun a series of breaks with the President over Iraq policy and could signal to the grass roots that it is time for an end to unconditional support for Bush. On the other hand, Republicans in the House have retained their unity in support of the President's Iraq policy and so far Republican presidential candidates have refused to repudiate the President. With the divisive immigration bill behind him Bush may be able to sustain a new plateau in partisan support leading to a flattening out of his approval trend. That assumes independents, or at least 20-25% of them, will also stay on board. The other reason to think we may have reached a new plateau is that both the AP and the Newsweek polls are normally a bit below the trend estimate. 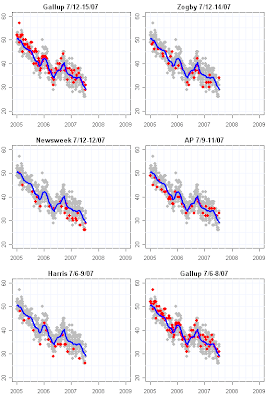 AP is normally .93 percentage points below trend, while Newsweek averages 1.15 points below trend. While either current poll could well be randomly high and their next results return to below trend, these are not polls we usually expect to run above trend. So the current estimate at 28% approval still signals deep trouble for President Bush, and the trend may remain in the 20s. But to sink much more is going to require a significant desertion by Republicans and/or Independents, moving below their current levels of support. The most likely way for that to happen is for Republican leaders to turn against the President. Will they? News broke today of a major shakeup of the McCain presidential campaign. This on the heels of a second poor financial quarter and a mere $2 million cash on hand. The financial and staff disaster however simply reflects the trouble the campaign was in with voters. While McCain was widely said in 2005 and 2006 to be the front runner for the Republican nomination, he consistently polled a few points behind Rudy Giuliani in that period. Since January of 2007, McCain's national level of support from Republican voters has steadily declined from nearly 25% to just over 15%. That national decline would be bad enough for any campaign, but the situation in the early primary states has been even worse. 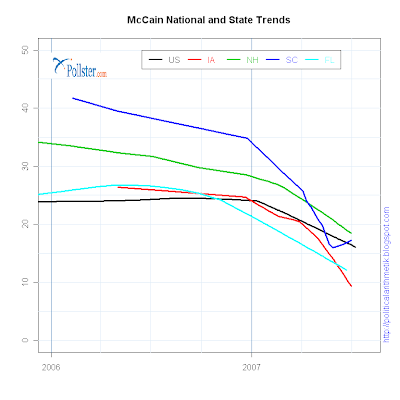 The most dramatic failure has been in South Carolina, the state where McCain invested most heavily and where he did the most politically to mend fences demolished in the 2000 campaign. McCain's frequent visits, staff allocation and public shifts to reposition himself vis a vis South Carolina political issues and political and religious leaders initially paid off in support from around 40% of Republicans in the state as of early 2006. But the trajectory of support there has been profoundly down, standing today at around 17%. In New Hampshire, the launch pad of the 2000 campaign, McCain has also steadily declined, from around 35% in early 2006 to half that--- 18%--- now. In Iowa, the state McCain wrote off in 2000 and initially tried to win this time, support has crashed from 25% to under 10%. And in Florida, the big state that moved up its primary this year, McCain has dropped from a high of 27% to 12%. Maybe different management would have raised more money and spent it less profligately, but only a message more attuned to Republican voters' preferences and concerns could have changed this campaign. Given McCain's positions over the past 7 years, perhaps no message could have been crafted that would have bonded voters to him. Only a miracle of Biblical proportions is likely to bring this one back. The results found 45% in favor and 46% opposed, with 9% undecided. Those are striking numbers, but deserve a bit of context. First, as anyone would expect, there are sharp partisan divisions on this question, with 69% of Democrats, 50% of independents and 13% of Republicans support impeachment proceedings. One might wonder if 13% of Republicans supporting the impeachment of their president is really a credible estimate here. It seems large, given continued Republican support for President Bush in job approval in comparison to that of Democrats and independents. Likewise, we might wonder if support for impeachment has risen in the immediate aftermath of the Libby sentence commutation. ARG asked an impeachment question in a poll taken 3/13-15/06. 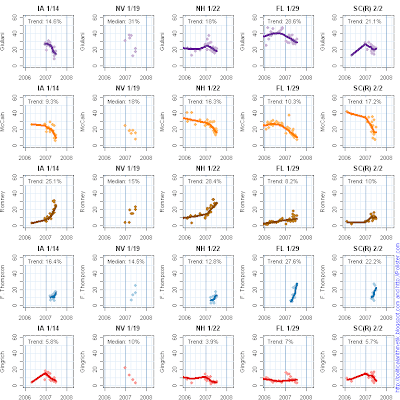 Those results are shown in the top right panel of the plot. There the findings were 42% in favor and 49% opposed. (There was a slight difference in question wording as well.) In that March poll, 61% of Democrats, 47% of independents and 18% of Republicans favored impeachment. So this comparison suggests a small increase in support overall, and among Dems and independents, and a small DECREASE in support for impeachment among Republicans since the March survey. But these are modest changes, not large increases in impeachment sentiment. One might also ask if the ARG survey results are typical of responses in other polls. There the answer is no, the ARG results show more support for impeachment than other polls do. As for trend over time, the latest poll prior to the new ARG that asked about impeachment was a Time/SRBI poll taken 11/1-3/06, just before the election. That appears in the bottom right of the plot. Their results were 25% in favor, 70% opposed and 5% undecided, VERY similar to the March Newsweek results. Finally, the breakdowns by party in the Time/SRBI poll are also similar to the earlier Newsweek: 48% Dem, 22% Ind, and 4% Rep in favor of impeachment. The conclusion is that there is little evidence for a substantial increase in support for impeachment, over the past 16 months, and the ARG results appear to be at the high end of support in comparison to other polling. It would be nice to have another new poll to compare with the current ARG results to see if this pattern has continued. American Research Group (ARG) has completed a poll taken 7/3-5/07 on President Bush's decision to commute the jail sentence of Scooter Libby. The results are similar to those of the "instant" poll by SurveyUSA taken the night the decision was announced. Do you approve or disapprove of President George W. Bush commuting the 30-month prison sentence of I. Lewis "Scooter" Libby while leaving intact Mr. Libby's conviction for perjury and obstruction of justice in the CIA leak case? The results are strongly structured by party identification, which is certainly no surprise. 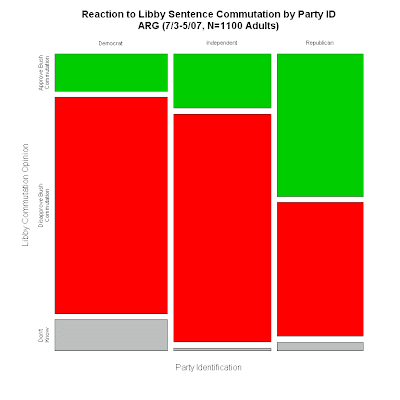 Only 13% of Democrats and 19% of Independents approved of the commutation, while 50% of Republicans approved. However, as with the SurveyUSA poll, a substantial fraction of Republicans disapproved-- 47% in the ARG poll. Unfortunately, we can't tell for sure how many of these disapproved because the wanted a full pardon compared to how many disapproved because they wanted Libby to serve out his sentence. The survey did ask if respondents favored a pardon, but the news release (so far at least) has not given the cross tab between these two questions which would let us know how these two different reasons for disapproval break out. Perhaps that will be released later. The high levels of disapproval among Democrats and Independents is not surprising, but the high disapproval among Republicans is surprisingly high. 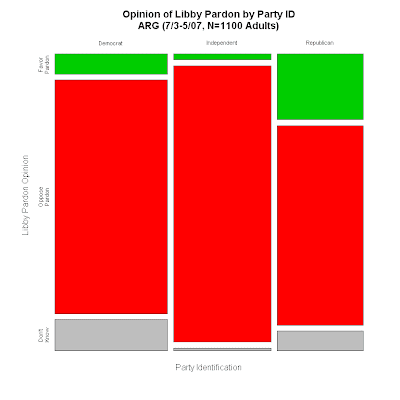 When asked if they favored a full pardon for Libby, 23% of Republicans said they did. 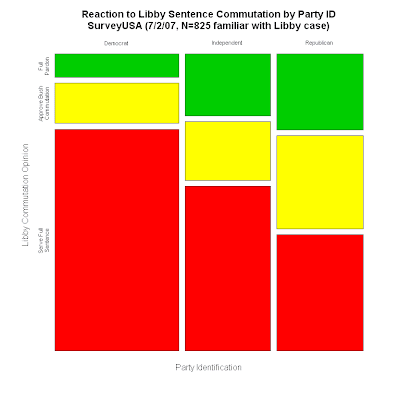 If we make the extreme assumption that ALL of these said they disapproved of Bush's commutation, then 47%-23%=24% of Republicans disapproved the commutation AND did not want a pardon, implying they thought Libby should serve his jail sentence. This is certainly an underestimate since it is doubtful that the pro-pardon group were entirely in the disapprove of commutation category, but it at least sets a lower limit on support for jail among Republicans. 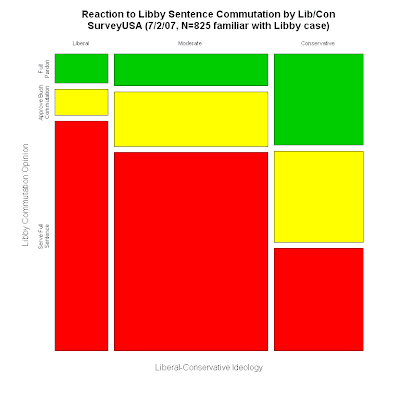 As with the SurveyUSA poll, this suggests a significant fraction of Republicans thought Libby should serve time in jail. Only 7% of Democrats and 2% of independents favored a pardon, compared to 23% of Republicans. A still large 70% of Republicans opposed a pardon, while 7% said they don't know. The independents in this sample are surprising for how overwhelmingly hey opposed a pardon, even more so than Democrats (82% Dem, 97% Ind.) That is puzzling enough that I'm not sure I believe the 97% number. It is NOT due to small sample size, because independents make up 33% of the ARG sample. The SurveyUSA poll didn't find Independents so much more extreme than Democrats on a pardon. Almost always we find independents between Dems and Reps on partisan questions like this, so I can't explain why independent opinion on this question would be so unanimous, when even Democrats are at least a bit more willing to see Libby pardoned. I'll hold out a possibility of a typo in the web page on this one. If correct, it is awfully huge opposition to a pardon among independents. 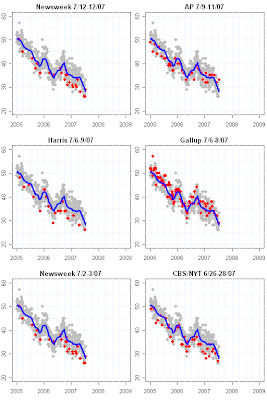 Compare these plots with those for the SurveyUSA poll here. There will surely be some new polling data taken or reported over the weekend on this, so we should learn more on how opinion is shaping up on this issue by Tuesday. This post gives an alternative view of the top candidates in both parties in the first five primary and caucus states. The data are the same as in my state-by-state view of the primaries (see the links in the column to the right), but here you can see each candidate across all five states. 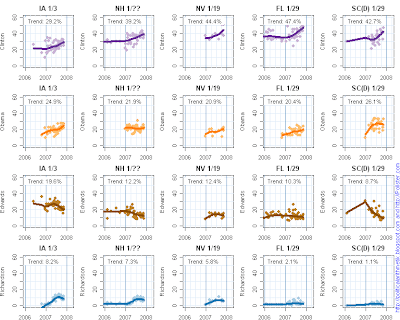 This allows easy comparison of one candidate across all states (reading across each row), as well as across candidates within states (reading down each column). The dates of each state's primary or caucus are what is currently expected, but are subject to change. This post will be updated in place. Look for a link in the right-hand column of links.